Does your boss do a lot of international business? Does your company do business all over the world? Then you’ve probably dealt with the dilemma of trying to set up international conference calls, or arranging a business call with a client or colleague in another country or on another continent. With all of the changes in Daylight Savings Time lately, figuring out time changes has just gotten harder. Well, I’ve got a solution for you. Meeting Planner – timeanddate.com allows you to enter up to six different locations and provides the relative times in those locations to help you plan the best time for a conference call. Calendars – you can open calendars for any number of countries along with their various holidays. Invaluable in planning meetings so you aren’t stepping on cultural toes. World Clock – if you register, you can select cities you need times for regularly so they’re at your fingertips. You can also get a digital clock to display on your website with various world times on it. International Dialing codes – timeanddate.com will also help you set up calls by providing the international calling codes for your particular call. 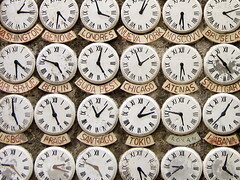 If you’re working in international business, timeanddate.com is an indispensable business tool. Hi Jodith – Thanks for the link. Being a blogger who has readers in all parts of the world, the world clock would be a huge benefit. I’ve been using timeanddate.com for at least 10 years. It’s a great resource! Thank you so much for your valuable tips! I recently got laid off and have never made travel arrangements for a boss. I am reading your site because most Administrative jobs require travel arrangements. I’m so happy I found your web site! Thank you again for this valuable information. I am sure you are helping so many of us! I’m glad you found your way here! Yes, most direct admin positions will end up making at least some travel arrangements, and in some positions, it’s a very heavy requirement. My first direct admin position was for a boss who was really a globetrotter. I got my experience under fire, so now I try to pass it on. Welcome and I hope you continue to enjoy the site! Jodith, this web-site will be very helpful, thank you. I am anxious to log on. I have done 4 international trips for previous boss. I’m in throes of looking for a new position and was passed over as their CEO travels quite extensively and trips very contrived. They felt I did not have enough experience with the International travel portion. Are there any tricks that would be helpful in planning International travel? To simplify matters?? I have a number of posts directed at travel. This link will take you to all of them. I have two posts there directly dealing with international travel here and here. If you have any specific questions about things I haven’t covered, just leave a comment, send me an e-mail, or contact me on Twitter.